IPCop is a small linux distribution providing simple firewall / router / NAT solution. When running as a virtual machine, it is advisable to have VMware Tools installed (at least to allow graceful restart/shutdown of the OS and reporting guest IPs in vSphere). However IPCop is a very limited distribution, lacking many needed tools like insmod / rmmod, PAM, init.d system (IPCop uses sysinit). Plus it is using kernel version 3.4, which is not supported by vmtools. See Enabling NAT on VMware ESX with help of IPCop for detailed insructions on how to install IPCop on ESX. But there is still an option to install vmtools under IPCop, although without any kernel modules – but the graceful shutdown still works. First initiate the vmtools installation from vSphere / vCenter via menu Guest –> Install/Upgrade VMware Tools (I am running under ESX 6.0 host in this example). Then mount the virtual CD and extract the package to a temp directory (we use /var/log filesystem because of how IPCop partitions its limited disk space). We remove all binary modules as none are for our kernel. IPCop itself needs less than 500 MB of disk space, so if you allocated only so much to the VM, take care you have at least 120 MB free in root filesystem (and about 250 MB in /var/log during the install process). Then we need to create some dirs, which vmtools installation expects, but are not part of IPCop’s system. Now we can start the installation script. It will complain about some tools not found, just reply with /bin/true for all of them. Also reply with our created directories when asked. is installed. Do you want to specify the location of this program by hand? it is installed. Do you want to specify the location of this program by hand? The path "" is not a valid path to the 3.4-3 kernel headers. The configuration will output message about each kernel module not being able to compile, just acknowledge it with Enter. At the end, you should have the vmtoolsd daemon running, but we still need to adjust the IPCop startup sysinit script to run vmtools start script at boot. /usr/bin/logger -t ipcop "Starting vmware tools"
File rc.event.local is run from rc.event, which is run at the end of rc.sysinit with parameters system and up. We need to remove the stale lock file first as we are not properly stopping the vmtools during shutdown. Now you can reboot IPCop to check if vmtools will be started during boot. VMware’s desktop products like Workstation include abilities to connect virtual machines (VMs) to outside network via NAT, but professional ESX hypervisor does not include any networking features (besides virtual L2 switches). So all such features must be done via a dedicated VM. One of the solutions is to use a small and efficient Linux distribution called IPCop. It requires only about 300 MB of disk space and maybe 256 MB of RAM (although I recommend to give it 512 MB of RAM and 512 MB of disk space). In my example I have default ESX vSwitch 0, which is connected to the only physical network card of my server (so it has ESX public IP configured). I have named it “Red network” to be consistent of the IPCop naming. However individual VMs cannot be connected to this switch as each of them would require their own public IP. 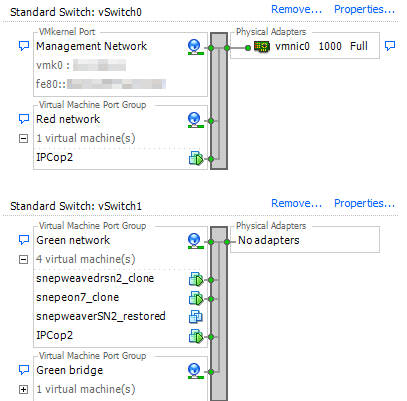 So instead we create an isolated virtual network (vSwitch 1) called “Green network”. As you can see this one does not contain any physical adapters, so the VMs are not able to communicate with outside world on their own. VMs will have private IPs and IPCop will provide them DHCP, DNS and internet access via NAT. Now you can connect the installation CD iso image to the virtual CD/DVD drive and start the installation. The process is easy, just follow the IPCop’s manual. You can identify the Red/Green network during installation by looking at the MAC address in the VM’s properties (as seen on the image above). Configure your Red interface with the connection type you have from your network provider (DHCP in my case) and don’t forget that IPCop must use an IP address which is different from main IP assigned to ESX itself. 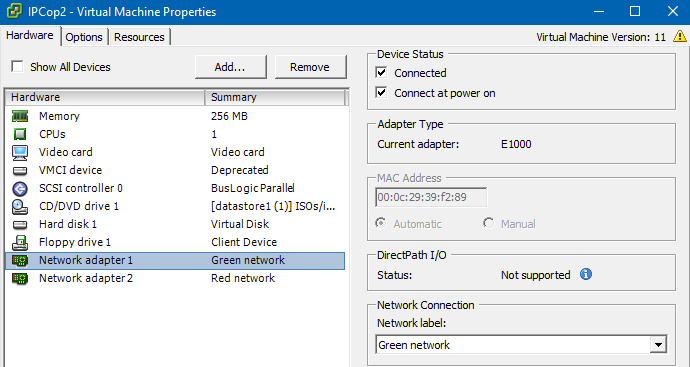 Just don’t forget to assign any new VMs just to the “Green network”, so it will get internet connection via IPCop. For more advanced users IPCop supports also DMZ network and OpeVPN access (so that your PC can be part of the virtual VM network and you can directly connect to them). After buying new Samsung Smart TV I noticed lot of ads on Youtube. I was surprised as on my Android phone and PC I have ads blocked (uBlock Origin for Firefox and AdAway for Android) for many years already. First I was thinking about setting a proxy on my home router, which would block the ads. However the TV does not have any proxy settings (probably because it would help circumvent GeoIP restrictions on paid streaming content?). I would say, no problem, we have transparent proxying. However proxy in transparent mode does not support https connections, which are used on many websites (including Youtube) nowadays. So no proxy solution possible. But if anyone wants it for devices which do support proxy settings, use Privoxy package for OpenWrt and privoxy-blocklist script. Then I have found a DNS-based solution. It works by returning modified DNS responses for domains which host ads. It is not as good as URL-based filtering, but still good enough (inc. Youtube ads, as well as video ads in SME TV application) and works for https or other protocols. I use Google DNS in my home. Its IPs are returned by my DHCP for all devices. I have manually configured TV to use DNS of my router instead. This way I can have “normal” DNS for most devices, but ad-blocking DNS for the TV. 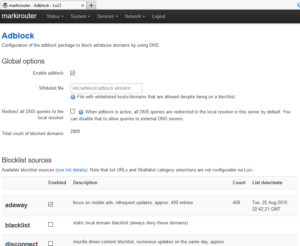 For OpenWrt (I am using 15.05 Chaos Calmer), install package adblock (and optionally luci-app-adblock for web interface). They are not included in the repository for CC, but can be downloaded from OpenWrt’s adblock github page. There you can find also detailed installation instructions (basically just download the packages to your router and use opkg install). You can configure a cron job to automatically renew the list of blocked domains. You can also choose which blocklists to use. 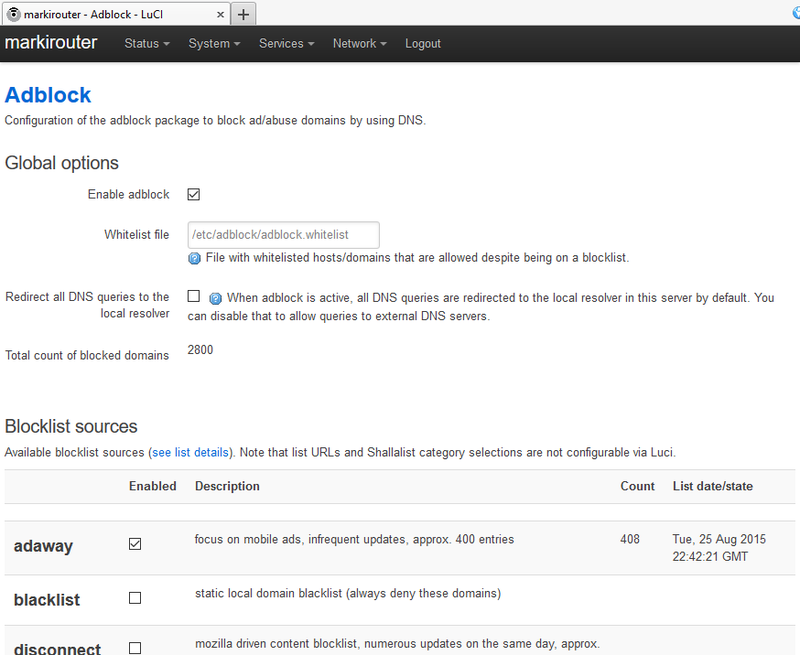 You can find Adblock easylist sources among the supported ones. Adding blocklists in different format is also easy, just add regexp which will filter the domain names from the list. The whole solution works by using dnsmasq (built in OpenWrt) to return special local IP (192.0.2.1) for ad serving domains. There is an instance of uhttpd webserver running on this IP on router, which returns empty page / empty gif for every request. If you are not running OpenWrt on your router, the same can be accomplished on any linux machine (does not even have to be in your home network), where you will run DNS server together with the script, which will populate the list of ad domains. Here are few tips I discovered while writing few systemd units for my new Debian Jessie system. You can find my unit files in my GitHub repository. I convered my simple perl script to systemd. Before, it was running in a screen session and outputting some status information to stdout. I used StandardOutput=journal parameter to redirect stdout to systemd’s journal. However the journal did not contain any output of that script. I have found out that by redirecting perl’s stdout to anything other than a terminal, perl turns on buffering, so the output would appear only after 8 kB of text. To disable the buffering, just put $|=1; in the beginning of your script. You can display the unit’s output by using command journalctl -u myunit. Note: /var/run is being replaced by (and symlinked from) /run, which is a tmpfs filesystem on modern distros. That implies it is empty after each boot. When a daemon is run under non-root user, its init.d script traditionally created a subdir inside the /var/run, which was then made owned by the non-root user under which the daemon will be run. Here is how the same can be accomplished in a systemd unit file. We use ExecStartPre to create the directory before the actual daemon is run. When PermissionsStartOnly is true, only the actual daemon is run under the defined user, but the pre-start commands are run under root. I use mkdir -p, which doesn’t return error even when the directory already exists (for example when the daemon is restarted several times). Systemd uses so-called targets instead of run levels. The main difference is that you can have only one run level active at a time. Targets are states which can be activated (or better said achieved), but there is nothing like an active target and more than one target can be achieved at the same time. The most interesting target is the multi-user.target. To start your service at boot, add these lines to your unit’s config file. By default, systemd units shipped with distro packages are put into /lib/systemd/system directory. Don’t modify any of these files as your changes would get lost on update. If you want to replace whole unit with your own version (and loose any further changes by updated package), you can put your copy of the unit file in /etc/systemd/system. When this exists, systemd will use it instead of the one in /lib. If you want just to change few settings, create a new directory /etc/systemd/system/mysql.service.d (in our case for MySQL daemon). Each file there will be read after the main unit file in /lib. I have created a file override.conf with this content to stop MySQL complaining about not enough open files limit. Certain options can be overwritten by specifying them 2nd time, some options are additive, so specifying them multiple times just adds new values to the list. If you want to replace such option, specify it without arguments first (Option=).